KUCHING: Hundreds of friends and relatives attended the requiem mass and funeral service for former Bishop of the Anglican Diocese of Kuching, the late Rt Revd Datuk Made Katib at St Thomas’s Cathedral here yesterday. The casket of the former bishop arrived at the cathedral at around 10am and was received by the Archbishop of the Province of South East Asia Most Revd Datuk Bolly Lapok and priests from the Anglican Diocese of Kuching. Bolly, who is also Bishop of the Anglican Diocese of Kuching, then led the recitation of Bible verses while the casket was brought into the cathedral. 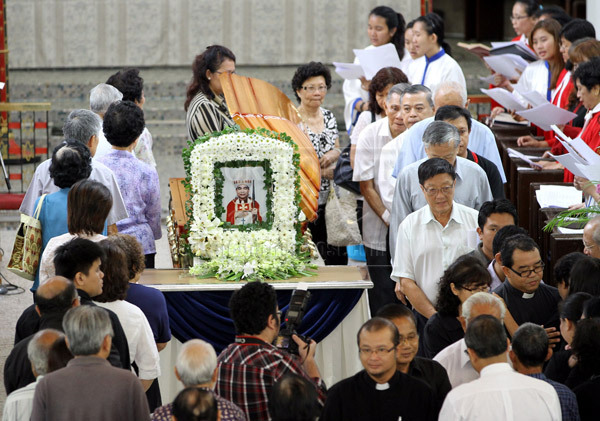 During his sermon, Bolly, in representing the congregation in the Diocese of Kuching, offered the late Made’s family his deepest sympathy and condolence. “We want to thank you Datin Matilda Thomas Ng and Elvina Mary Made for being there to sustain Bishop Made during his ministry in serving the church until the very end of his life,” he said. After the final blessing, the casket was then brought to the Anglican Cemetery at Jalan Batu Kitang for the last rites before being laid to rest. The late Made, 71 years old, passed away peacefully at around 5.50pm on Sunday at Sarawak General Hospital. By coincidence, the late Made’s funeral was also his birthday as he was born on Jan 23, 1942. Born to the family of the late Katib Nanja and Nyang Janggok, the former bishop was a Bidayuh who hailed from Kampung Annah Rais in Padawan. Before being ordained as a priest, the late Made studied at the University of Leeds, in Yorkshire, England. He took a general degree with three core subjects – English, History and Bible Knowledge and graduated in 1966. Following his graduation, he furthered his priesthood studies at College of the Resurrection at Mirfield in 1966. In 1968, he sat for his General Ordination Examination – which all British-trained priests were required to obtain. The late Made started his ministry as a deacon on Sept 22, 1968 and a year later was ordained as a priest by the Diocese of Kuching’s first indigenous bishop, the late Rt Revd Datuk Basil Temenggong. During his time as a priest, he served in many places in Sarawak. He was enthroned as the 12th Bishop of the Anglican Diocese of Kuching on Nov 20, 1995. The late Made retired from the ministry on Jan 23, 2007, which was also his 65th birthday. His service to the Church and state over the years was recognised by the government with the Pingat Terpuji Jubilee Perak (1988), Pegawai Bintang Sarawak (1992) and Panglima Gemilang Bintang Kenyalang (2001) which carries the title Datuk.